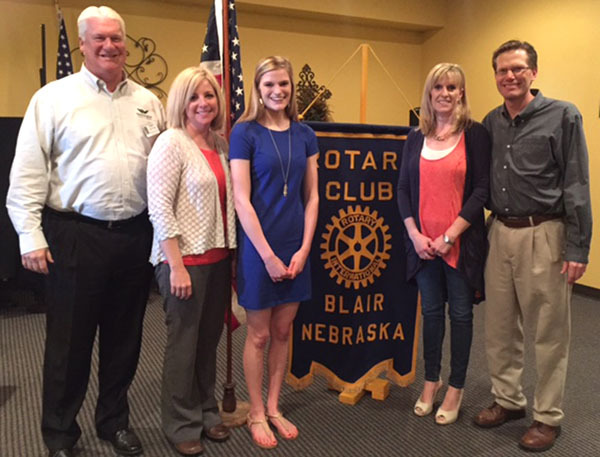 Emma Grote is Blair Rotary's Student of the Month and the recipient of a $500 scholarship. Among Emma's activities: softball and flag squad, including captain; AEP mentoring; math tutoring; and teaching Vacation Bible School. She has signed to play softball at Southwest Minnesota State University. Pictured from left: Terry Dutton, Rotary past president; Amy Hansen, scholarship committee chairperson; Emma Grote; and Emma's parents, Kristen and Kurt Grote.